This paper by David de Laat and Frank Vallentin is an exposition about the two recent breakthrough results in the theory of sphere packings. It includes an interview with Henry Cohn, Abhinav Kumar, Stephen D. Miller and Maryna Viazovska. de Laat, D, & Vallentin, F. (2016). 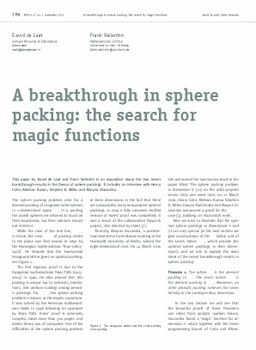 A breakthrough in sphere packing: the search for magic functions. Nieuw Archief voor Wiskunde, 17(3), 184–192.